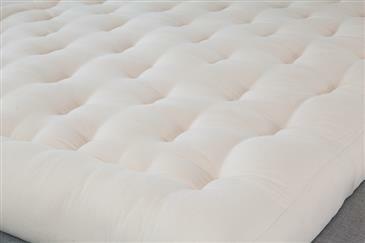 Buy Green Cotton & Wool Boulder Dreamton futon at WhiteLotusHome USA. A wrapping of about 1/4" Pure Wool around the Green Cotton layered core. Made of 100% Green Cotton. It comes in 6 inch thickness and it can be made up to 8 inches thick. This futon is the firmest mattress we make. The surface is flat, firm, and very supportive. The Boulder Cotton is hand made in the same style as the firm mattresses that have been made for centuries in India and Japan. I've had this futon for almost 6 months and it is perfect, I got exactly what I was expecting. It is firm but feels supportive. There was no funky smell upon receiving this futon (like with most other mattresses). I am very much enjoying this futon and recommend White Lotus to anyone searching for better and healthier mattresses/bedding. Which organic queen mattress would be the softest? Our Pure Cotton and Wool Dreamton Futon would be considered as our softest organic cotton filled option but it is still considered a medium firmness. Some customers prefer to also add a Wool or Organic Cotton Topper to increase the comfort of that or any other mattress. Let us know if we can help answer any other questions 732-828-2111.
what's the difference between green cotton and pure cotton? Our frequently asked questions is the best place to review this question and many others you may have. In general we only carry GOTS certified Organic Cotton and Green Cotton which is conventionally grown cotton. The Organic Cotton is considered the PURE cotton.